The NEW MOON occurs on Friday, April 5th, 2019, at 4:50 AM EDT. On Friday morning, the New Moon occurs. The New Moon in Aries marks the beginning of a new cycle. The Pisces New Moon cycle ends and the Aries New Moon cycle begins. The New Moon in Aries is a good time to commit to personal goals that express the positive energies of the sign of the Ram. It’s time to take action – try something new and innovative, and go at it with gusto and confidence; be assertive without being abrasive; take charge of our lives; start a brand new project, and discover our own personal courage. This is a strong cycle under which to re-evaluate our relationship to ourselves. With this potent Aries energy, we have the chance to make important changes in our lives. It’s time to make some solid yet realistic plans and to set the stage for reaping the rewards from our new beginnings, as little or big as they may be, in approximately two weeks’ time after the Full Moon occurs. Aries is the first sign of the zodiac, and thus a New Moon in Aries is especially ripe with opportunity for new beginnings. We might consider acting on a constructive impulse and following a hunch or taking a risk. Aries learns through experience and action, so we might treat ourselves to a little adventure now. It’s also a good cycle under which to discover the benefits of expressing ourselves with authenticity – expressing ourselves as we are, without putting on airs. We might also find ways to learn how to rely on ourselves and to be happy about doing so – it will go a long way towards finding inner happiness when we know that we can be self-sufficient without blaming others for not helping us out. It’s a time to revitalize ourselves through experiences that break the routine and that involve doing something new and fresh. However, the New Moon forms a square to Saturn, suggesting some blocks surrounding our new beginnings. Something may not get off the ground as quickly as we’d like now. Even so, we’re in a rare window when none of the major planets/bodies are retrograde, and things may very well swim along after this check-in with reality. This phase of the Moon occurs at 15 degrees and 17 minutes of Aries, affecting people born with personal planets and points at approximately 11 to 19 degrees of the Cardinal signs (Aries, Cancer, Libra, and Capricorn) most significantly. The LAST QUARTER MOON occurred on Thursday, March 28th, 2019, at 12:10 AM EDT. Very early Thursday, the Last Quarter Moon was exact, when the Sun in Aries forms a square with the Moon in Capricorn. The Last Quarter Moon phase points to some sort of crisis of consciousness. After basking in the awareness symbolized by the full light of the Moon at the time of last week’s Full Moon, we disperse our knowledge and come to a point when we need to sort out what works for us–and what doesn’t–in preparation for next week’s New Moon, when something new is born once again. This is not the best time to start a major project, as the decreasing light of the Moon symbolizes a descent into unconsciousness. It’s time to begin finishing up the details of that which was conceived at the last New Moon. What revelations did you have last week? What did they mean for you? What can be done now? 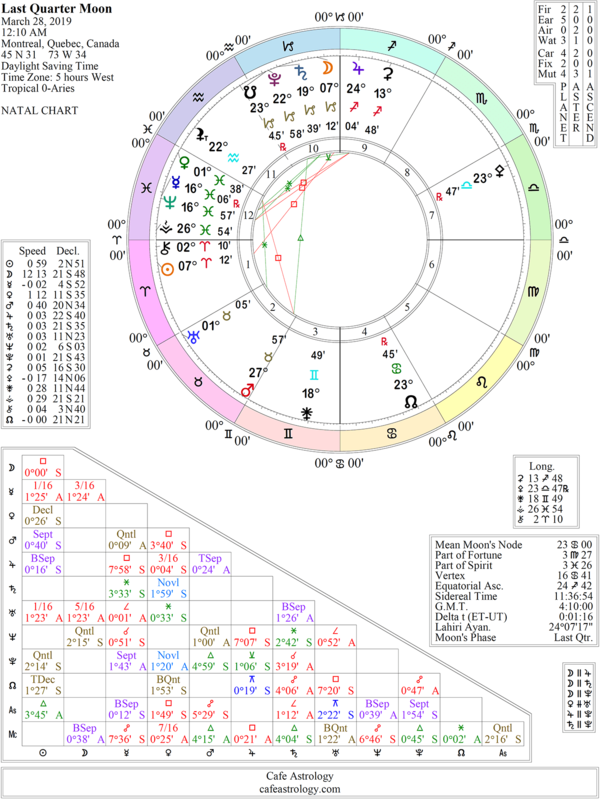 This phase of the Moon occurred at 7 degrees and 12 minutes of Capricorn forming a square to the Sun at 7 degrees and 12 minutes of Aries, affecting people born with personal planets and points at approximately 5 to 9 degrees of the Cardinal signs (Aries, Cancer, Libra, and Capricorn) most significantly. This week: The Sun is in Aries; Mercury is in Pisces; Venus is in Pisces; Mars is in Taurus until the 31st, after which Mars is in Gemini. The Sun is in Aries from March 20-April 20. In Aries, the Sun is enthusiastic and spontaneous. We are motivated by the desire to conquer. We are more impulsive and we want to initiate. Aries is a sign that bounces back quickly–there is little shame with Aries. There are few, if any, apologies! Aries is brave and pioneering, and somewhat innocent. We are direct and rather uncomplicated in our needs, but we can also be short-sighted and lack the desire to plan ahead. Mercury is in Pisces from February 10-April 17. When Mercury is in Pisces, our thinking processes are more visual, intuitive, and imaginative. We are especially attuned to the world of emotion, which colors both our thoughts and our communication style. We guess well, express ourselves with imagery, and make decisions intuitively. We are more attracted to consciousness-raising information. Venus is in Pisces from March 26-April 20. Pisces never sees the world in black-and-white terms. Rather, Pisces sees all the colors of the rainbow. With the goddess of love in Pisces, our love is all-embracing, we are able to forgive and understand, we are seducible and seductive, and we show compassion to our partners. Venus in Pisces is tender and affectionate, although hard to reach nevertheless, as there is a longing for something that is hard to define and hard to satisfy. Borders and boundaries blur under Venus in Pisces. The shadow side of this position is allowing ourselves to be victimized or deluded, as well as evasiveness. Mars is in Taurus from February 14-March 31. We are determined, stubborn, and resolute. Mars in Taurus can be passive, and is at its strongest when resisting or defending something! In stark contrast to the impulsive Mars in Aries cycle, we tend to pursue our goals by plodding along patiently. Our goals are longevity and long-term satisfaction. Mars is in Gemini from March 31-May 15. In Gemini, Mars is considerably more versatile and flexible–and considerably less determined and focused! Our interests become more diversified, possibly to the point of going off on so many tangents that we are scattered and ineffective. Saturn transits Capricorn from December 19/20, 2017, to March 21, 2020; and then finishes up its transit from July 1 to December 17, 2020. Read about Saturn’s transit through Capricorn here. Jupiter entered Sagittarius on November 8th, 2018, and transits the sign until December 2nd, 2019. Read more about the Jupiter in Sagittarius transit. Uranus is in Taurus. Uranus first transited Taurus from May 15, 2018, to November 6, 2018, and is now consistently in the sign (since March 6th, 2019) until 2025/6. We approach money and personal possessions in new ways and learn how to free ourselves from certain material constraints. Innovative ways to make ourselves comfortable emerge. We’re less inhibited about expressing sensuality, self-love, body love, and pampering. We’re challenging what we previously valued during this cycle. There can be abrupt changes with money, valuables, possessions, and income that lead to a reshuffling of priorities or values. Income might come from non-traditional sources or ventures. We’re bringing progressive ideas to the world of business. New ways of doing business, as well as making, viewing, and handling money are likely. Income and the energy we put into making money can be variable. Venus is in Pisces from March 26-April 20, 2019. Like Aquarius, Pisces love is universal. However, Pisces draws no bounds in love. With Venus in Pisces, we have compassion (and perhaps attraction) for those who are left out, overlooked, or victimized. We are self-sacrificing, and we have a hard time setting up borders. The walls go down, we have a hard time saying no (especially if our compassion is engaged), but we are also prone to avoiding all that makes us feel uncomfortable. Wishful thinking is one expression of Venus in Pisces. We can too easily believe what we want to believe. People can be hard to pin down, and love is hard to define under this influence. Pisces never sees the world in black-and-white terms. Rather, Pisces sees all the colors of the rainbow. With the goddess of love in Pisces, our love is all-embracing, we are able to forgive and understand, we are seducible and seductive, and we show compassion to our partners. Venus in Pisces is tender and affectionate, although hard to reach nevertheless, as there is a longing for something that is hard to define and hard to satisfy. Borders and boundaries blur under Venus in Pisces. The shadow side of this position is allowing ourselves to be victimized or deluded, as well as evasiveness. 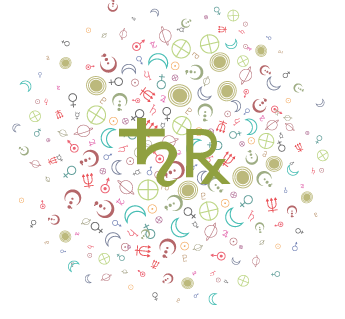 This week: On Monday and Tuesday, Venus forms a semi-square to Pluto, suggesting some reticence with others if we’re feeling insecure or concerned about matters of trust. Venus in Pisces March 26-April 20. A martyr complex, a love for the underdog, a search for your soul mate: such are the experiences associated with the new cycle you’re now just beginning. A yen for soul-stirring romance, a weakness for the weak, and a tendency to idealize people and relationships … very aesthetic, very other-worldly. Venus semi-square Saturn March 30. Feelings of isolation, of not getting what we really want, and of not being loved the way we want to be loved can get in the way of pleasant relations with our partners. Venus semi-square Pluto April 1-2. Tendencies to look for something wrong in a relationship. Jealousy raises its ugly head. Venus semi-square Uranus April 9. Uncertainty about the desire to be close to someone. Freedom versus closeness. A desire to experiment in the romance department may be fleeting and ultimately unsatisfying or frustrating. Venus conjunct Neptune April 9-10. New and fresh beginnings on romantic levels characterize this transit. Heightened sensitivity to, and awareness of, beauty and spirituality. We are easily influenced, seducible and seductive, and given to strong powers of imagination. We are more attuned to the world of beauty and romance. Gentleness with others is the best way to harness this energy. A magical time on a romantic and social level, but it could also be a confusing or illusory influence as well. Psychic openness and compassion. Venus sextile Saturn April 11-12. Relationships are stabilized and steady, although feelings are expressed reservedly, formally, or sparingly. A new sense of realism in existing partnerships. Relationships begun under this influence possess a distinctly practical theme, almost as if the partnership is a business endeavor. The Void of Course Moon is the period of time after the Moon has made its last aspect in one sign until the Moon enters a new sign. During the Void of Course Moon periods, it is generally wise to stick to routine rather than to begin new projects. 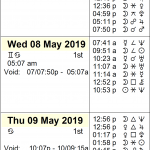 The last aspect the Moon makes before changing signs is indicated here and is indicative of the “outcome” of the matter (whether that is a new project begun before the void period or the answer to a question in Horary Astrology). Void of Course in Horary Astrology: If you were asking a question and making a chart for the answer, as you do in Horary astrology, it is said that since the Moon is not looking forward to any more aspects in this sign, you would have to say that the answer is not forthcoming; any questions asked at this time would not come to pass. The Moon being Void is one of the Strictures against Judgment in Horary Astrology. The following tables incorporate the modern planets, but some astrologers do not count Uranus, Neptune, and Pluto in void Moon calculations. Void-of-course Moon on Sunday, March 31st, from 11:03 PM EDT, with the Moon’s last aspect before changing signs (a sextile to Jupiter), until the Moon enters Pisces the next day, Monday, April 1st, at 10:49 AM EDT. 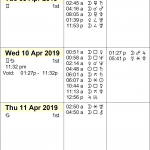 VOC Moon on Wednesday, April 3rd, from 11:36 AM EDT, with the Moon’s last aspect before changing signs (a square to Jupiter), until the Moon enters Aries at 10:57 PM EDT. 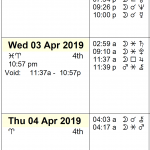 VOC Moon on Friday, April 5th, from 10:15 PM EDT, with the Moon’s last aspect before changing signs (a trine to Jupiter), until the Moon enters Taurus the next day, Saturday, April 6th, at 9:07 AM EDT. This week, the Moon is waning this week until the New Moon on the 5th – a period that is generally considered unfavorable for new beginnings with exceptions. (See Best Time to Start a Business for more details). The Moon is waxing after the New Moon on the 5th, which is generally considered favorable for new beginnings, again with exceptions. 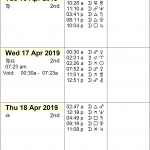 According to principles of timing with the Moon, a window of opportunity occurs this week from Saturday, March 30th, from approximately 1:15 AM EDT, until Sunday, March 31st, at approximately 11:00 PM EDT, while the Moon is in Aquarius. 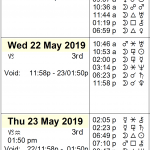 See also the following articles and tables: Timing with the Moon and Opportunity Periods with the Void Moon for times and techniques. 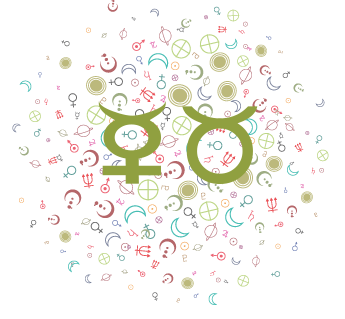 See also: Astrology of Today – an overview of the day (this takes you to my other site, Astrology Cafe). See also: The Astrology of 2019 – Overview. Note: Times given are Eastern Time (ET). Mercury conjunct Neptune. Our intuitive creativity is stimulated under this influence. A very positive transit for artistic and literary endeavors. We get insights into our own minds. Conscious reasoning can be distorted by subconscious matter, so concentrating on cold hard facts can be challenging. Daydreaming, visualization, and prophecy are stimulated. Communications may be unclear, vague, or downright confused. We may be subject to deception. Avoid signing contracts under this influence. Venus semi-square Pluto. This influence can point to some underlying tensions in social interactions (looking for an ulterior motive or an agenda, suspiciousness) and relationships (possible jealousies). Passions run high and hot, but there’s a hidden agenda. Feelings of jealousy and possessiveness run so close to the surface that others can almost feel the heat, and they are in direct proportion to our fear of losing something or someone dear to us. Avoid starting a new relationship at this time, because it can be characterized by these energies. Sometimes, this transit correlates with unreciprocated feelings in love or romantic disappointment. Often, financial matters come to the fore. Manipulation can color relationships now. Avoid power plays with friends and lovers. Mars sextile Chiron. We may have the opportunity to take the lead, or to take action, regarding matters that lead to healing, cleansing, or teaching now. We can feel a sense of mission. There is likely to be a feeling of fearlessness when it comes to addressing problem areas, and self-confidence as well. There is a drive to take positive action, usually to defend or help others (or ourselves). It’s a strong period for cooperation and purposeful activity. Note: Times given in the table/calendar above are Eastern Time (ET). 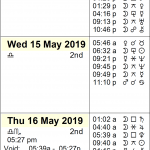 See below for day-by-day forecasts and planets in signs. See also Transit to Transit aspects. See also: Astrology of Today – an overview of the day – Astrology Cafe. 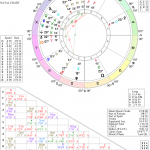 See also the new Astrology Trends Calendar that includes these daily trends overviews and other astrological events such as ingresses, stations, and lunations. Mars enters Gemini today, where it will transit until May 15th. In Gemini, Mars is versatile and flexible but also not especially determined or focused. We have diversified interests, but we should watch for becoming too scattered and ineffective. The Moon is in Aquarius all day, harmonizing with Jupiter this afternoon. We can be “good company” with this combination, enjoying socializing with one another and exchanging ideas. The Aquarius Moon inspires our need for emotional freedom. We thrive on intellectual stimulation, change, and unusual or unconventional experiences. We’re especially idealistic, independent, and socially aware. 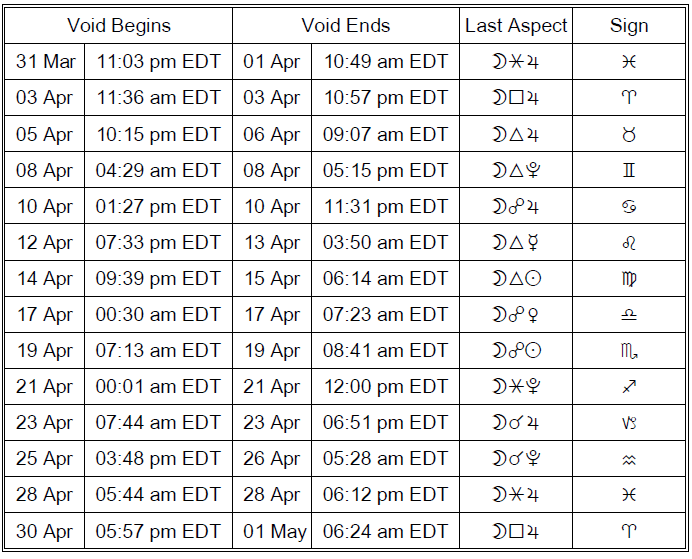 The Moon is void from 11:03 PM EDT, with the Moon’s last aspect before changing signs (a sextile to Jupiter), until the Moon enters Pisces the next day, Monday, April 1st, at 10:49 AM EDT. The Moon continues its transit of Aquarius until 10:49 AM EDT, after which it transits Pisces. The Pisces Moon is compassionate and spiritual, generally encouraging an intuitive approach to the day. However, the Moon forms a square to Mars today, firing up our feelings and stirring us into action, although possibly also prompting some missteps. A Venus-Pluto semi-square is pending, exact tomorrow morning, and suggests some suspicion or reticence with others if we’re feeling insecure. Mercury and Neptune are heading into alignment for the final of three such passes during Mercury’s extended stay in Pisces, helping to ease some tension as a block releases. All in all, it can be a day of moving between wanting to believe the best and not quite believing or trusting! The Moon ends its void period when it enters Pisces at 10:49 AM EDT. Mercury and Neptune align this morning, and the Pisces Moon aligns with both bodies later today, pointing to interesting ideas, tastes, conversations, and musings today. A semi-square between Venus and Pluto this morning can find us wrestling with matters of trust, particularly if we’re fearful of losing something or someone, even for a moment. However, overall, this is a time when we’re inclined to trust and put our faith into something we may not fully understand but want to believe. We may decide to enjoy a bit of mystery, leaving some things up in the air. The Moon continues its transit of Pisces most of the day, until 10:57 PM EDT, at which time it enters Aries. We’re in a good position to negotiate and compromise. Mars forms a sextile to Chiron today, and we may have the opportunity to take the lead, or to take action, regarding matters that lead to healing, cleansing, or teaching now. We can feel a pleasant, motivating sense of mission. We can be fearless about addressing problem areas. There is a drive to take affirmative action, most likely to defend or help ourselves and others. We want to fix problems, and we latch onto projects and activities that give us a stronger sense of purpose now. The Moon is void from 11:36 AM EDT, with the Moon’s last aspect before changing signs (a square to Jupiter), until the Moon enters Aries at 10:57 PM EDT. The Moon spends the day in the sign of Aries today, and while it’s a pioneering, action-oriented sign, the New Moon in Aries will occur tomorrow morning, making it essential to wind down rather than wind up today. Nevertheless, things are likely to flow along smoothly today as the Moon aligns with Chiron and harmonizes with Mars. It’s natural for us to gravitate toward satisfying, healing activities. We’re asserting our needs more easily than usual today. Needs and cravings harmonize with those of our loved ones. While we’re more independent than usual with the Moon in Aries, it makes us feel good to help and support others. The New Moon occurs in the sign of Aries this morning at 4:51 AM EDT. With this new beginning, we’re in a good position to consider a commitment to personal goals that express the positive energies of the sign of the Ram. It’s time to take action – try something new and innovative, and go at it with enthusiasm and confidence, take charge of our lives, and discover our courage. This is a strong cycle under which to re-evaluate our relationship to ourselves. Aries is the first sign of the zodiac, and thus a New Moon in Aries is especially ripe with opportunity for new beginnings. We might consider acting on a constructive impulse and following a hunch or taking a risk. Aries learns through experience and action so that we might treat ourselves to a little adventure now. It’s also a good cycle under which to discover the benefits of expressing ourselves with authenticity – expressing ourselves as we are, without putting on airs. We might find ways to learn how to rely on ourselves and to be happy about doing so – it will go a long way towards finding inner happiness when we know that we can be self-sufficient without blaming others for not helping us out. It’s a time to revitalize ourselves through experiences that break the routine and that involve doing something new and fresh. The New Moon’s square to Saturn suggests some blocks surrounding our new beginnings. Something may not get off the ground as quickly as we’d like now. 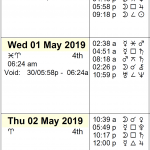 Even so, we’re in a rare window when none of the major planets/bodies are retrograde, and things may very well swim along after this check-in with reality. 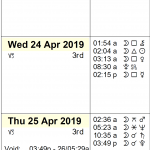 The Moon is void from 10:15 PM EDT, with the Moon’s last aspect before changing signs (a trine to Jupiter), until the Moon enters Taurus the next day, Saturday, April 6th, at 9:07 AM EDT. The Moon continues its transit of Aries until 9:07 AM EDT when it enters Taurus. The Moon in Taurus is steady, sensual, deliberate, and stubborn. Earthy activities and sensual pleasures appeal more than usual, and we find a sense of peace and contentment with that which is familiar and reliable. Life may seem to move a little more slowly now, mostly in a pleasant way. With the Moon’s alignment to Uranus today, however, we’d be wise to embrace some level of change and progress, or we could feel tense and rebellious. Mercury’s approaching sextile to Saturn can help ground us and remind us of the usefulness of taking things one step at a time. 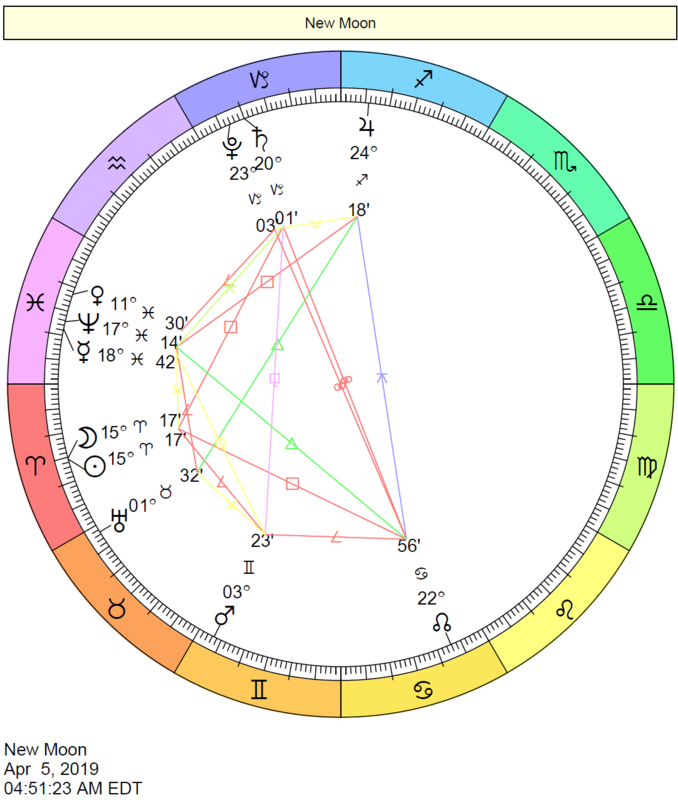 The Moon continues its void period until it enters Taurus today at 9:07 EDT. 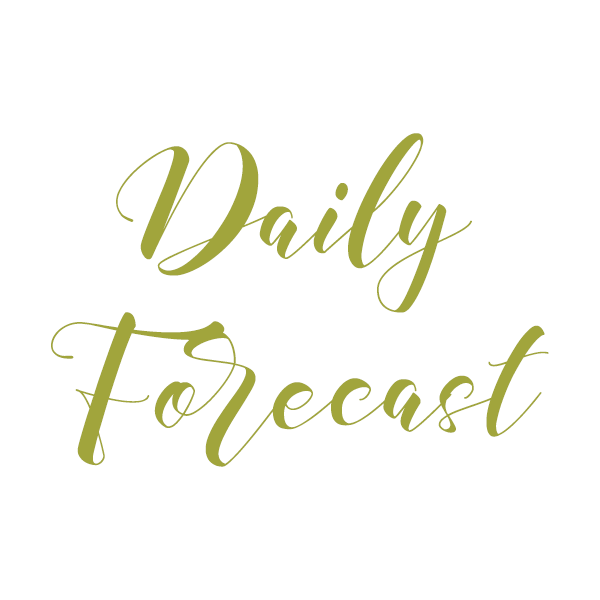 If it’s your birthday today, see our feature, If Today is Your Birthday Forecasts, for a free forecast for the upcoming year. Attraction to all that is new and unusual, and an instinctive need for improvement, characterize the Moon in Aquarius. Reactions are more intellectual than emotional, and interactions are more impersonal than personal, under this influence. This is a time that promotes social gatherings, dealing with group ideals and goals for the future, brainstorming, new ideas, and progressive changes. We are open to new methods of doing things and we have our eye on the future. It can be hard to stick to schedules now, as personal freedom is most important to us. The Moon in Aquarius generally favors the following activities: Unusual or radical undertakings, social pursuits, group projects, trying something new, joining a group. We may not want to face reality while the Moon is in dreamy, impressionable Pisces. It can be a wistful, sensitive, intuitive, and compassionate time. We are especially imaginative, and our intuition reigns under this influence. Boundaries and walls come down, as Pisces energy merges and blends. It's a time when details are overlooked and feelings defy description. The Moon in Pisces generally favors the following activities: Imaginative undertakings, mystical or spiritual pursuits, inner development, music and drama, going on a retreat, activities involving water. We're motivated by a strong desire to start fresh. A gut instinct to start something new is with us now, as well as the gumption to do so. Our pioneering impulses are strong, and we feel energetic, spontaneous, and enthusiastic. We may also be tactless and impulsive now. Excess energy is best channeled into physical activity. The Moon in Aries generally favors the following activities: Quick actions that yield immediate results. Undertakings that involve the self and the personality. (Staying power may be lacking). Self-assertion, taking on challenges, beginning short-term projects. We are motivated by the desire for serenity, security, peace, and comfort. The Moon is at her most sensual and constant in Taurus. Our basic impulses are to relax, resist change, and "stop to smell the roses". Life slows down a little, and we get comfortable. We may also be inclined to stubbornness and materialism under this influence. The Moon in Taurus generally favors the following activities: Substantial and material actions that yield solid results. Financial activities, and those involving personal possessions, applying for a loan, beginning a potentially long-term relationship, music, home decor. Sun in Aries A new sense of self, a more assertive personal style, a more dynamic approach to life: these are the hallmarks of the cycle that begins for you now. Doubts fade into the background, and reserve is more and more a thing of the past. It’s time for action; your destiny is in your hands, rather than set apart. Full speed ahead (“and damn the torpedoes”) is your motto now, for better or for worse! Venus in Pisces A martyr complex, a love for the underdog, a search for your soul mate: such are the experiences associated with the new cycle you’re now just beginning. A yen for soul-stirring romance, a weakness for the weak, and a tendency to idealize people and relationships … very aesthetic, very other-worldly. Mars in Taurus Making the most of what you’ve got, striving for security and stability: that’s the impulse that stirs in you as a new cycle begins in your life. New frontiers? That’s kid’s stuff for you now! What you want is to build something that will last: a pyramid, a Great Wall – you know, that sort of thing. Steady, patient, solid: that’s your style now. Mars in Gemini Learning, communicating, the exchange of ideas: these are the experiences you crave as a means to make your mark now, as a new phase begins in your life. You’re a person with something to say, and you realize that others have information that is essential to your goals. A time of much mental energy and initiative … perhaps with an element of conflict tossed in for good measure. 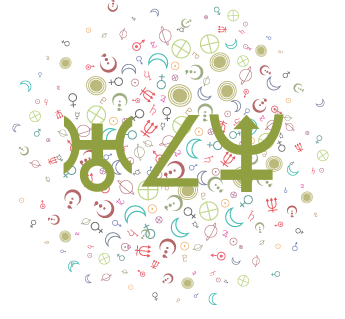 Jupiter in Sagittarius Faith, optimism, and a yearning to explore all kinds of new horizons: these are some of the focal points in your life at this time. Travel, education, and other ways to stretch your horizons open new doors of opportunity. Religious, philosophical, and cultural matters are likely to have special appeal for you now; transmitting ideas on a broader scale brings gain. Saturn in Capricorn Responsibility, hard work, ambition, and achievement: these are the foundations you need to build on now, as a new cycle dawns in your life. And yet, there is a tendency to be a little too hard, perhaps a bit cold, in your approach to these things. Let ambition take you to the top, but don’t let it lull you into thinking that the end justifies the means. Uranus in Taurus Practicality and ingenuity combine as powerful drives in your life now that you have begun a new cycle. Taking innovative concepts and making them real and practical is your strong suit; getting stuck in the mud is to be avoided at all costs. Financial savvy, inventiveness, worldly genius. 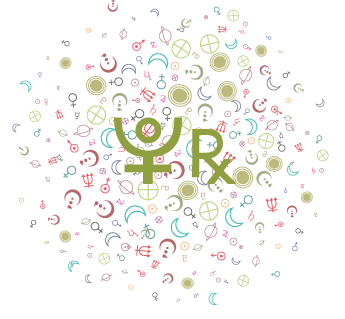 Neptune in Pisces Things spiritual and psychic take the driver’s seat of your imagination as you begin a new cycle. The fine arts and all manner of fantasies assume a larger-than-life importance. Surrendering to fate, karma, and other powers greater than merely mortal may be seen as the ultimate liberation. If all is Maya (illusion), what is the reality that gives rise to the world of appearances? The interpretations in this box are from the Day Watch software. 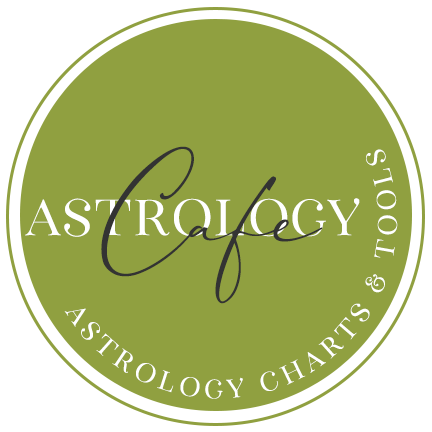 Take a peek at the year ahead with in-depth Future Forecast Reports from Cafe Astrology.